.....healthy eating starts at home. Chapati is flattened wheat bread that is quite popular in India and is served for dinner or even breakfast along with veg or non-veg curries. 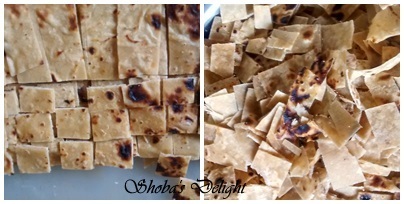 The dough for making chapathi is made by kneading wheat flour and water there were so many leftover chapatis. Today I did not have mood to make any side dish for that. Then I remembered my grandmother’s recipe with leftover chapatis. These pack nicely as well for lunchbox. 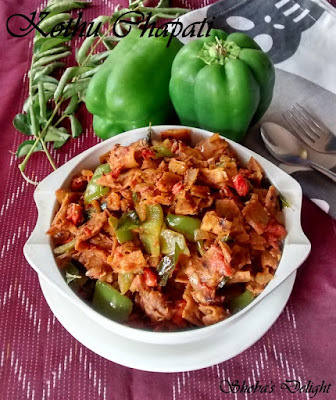 A filling dish, which is on the lower calorie and carb side. 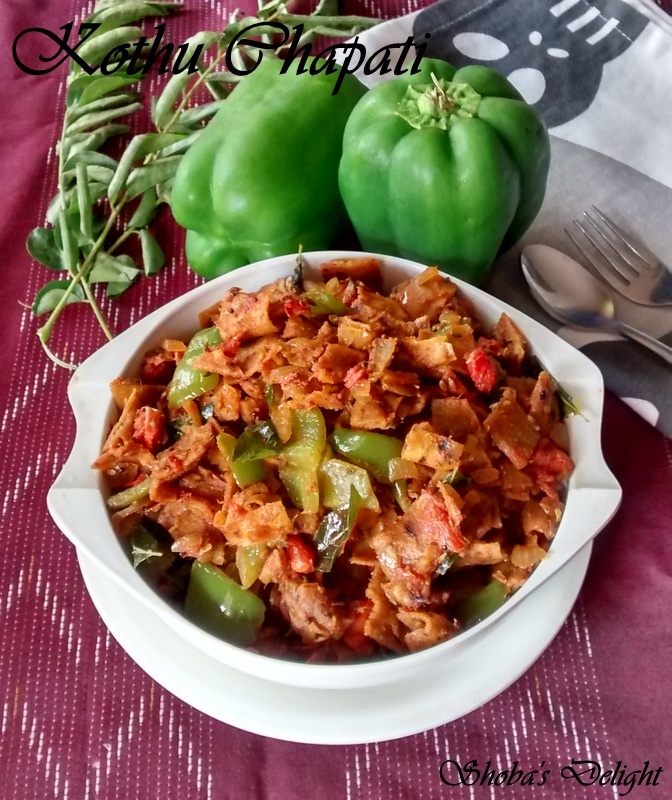 This dish is spicy enough and can be just served with curd. 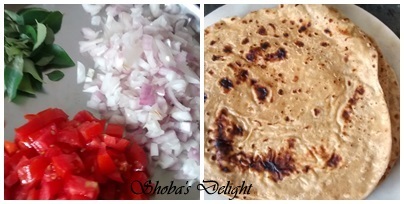 If you are left with few chapathis from previous day's dinner but don’t have any side dish you can try this. To me left-over recipes like this one are something to look forward to. So sometimes I purposely make extra chapathis to make this one the next day. 1. Tear the chapatis into small pieces. Chop the onion, tomato, curry leaves and slit green chillies. Once the oil is hot, add the cumin seeds and fry for a few seconds. 2. Add the diced onions and sauté until translucent. 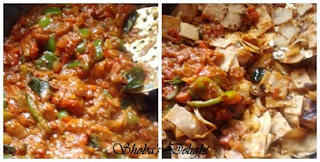 Now add the diced tomatoes, capsicum, green chilies, and ginger-garlic paste and keep sautéing until everything is blended. 3. Add some salt and fry till the tomatoes become soft. Cook closed under low flame for 5 minutes until the vegetables are cooked. 4. Now add the turmeric powder followed by red chili powder, coriander powder and garam masala. 5. 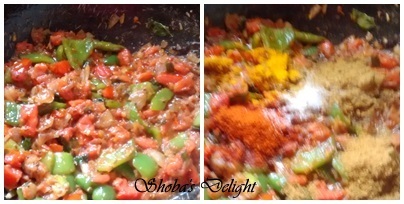 Add chapathis and sprinkle handful of water so that the masala can be easily absorbed by chapathis. 6. Fry for another 3 minutes until it is mixed properly. Finally add coriander leaves. Mix well and switch off. 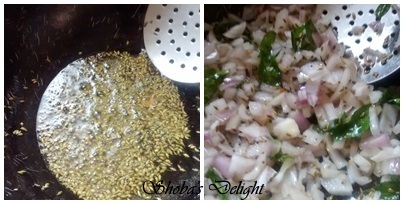 Serve this along with onion raita. Turn off the heat and add the lemon juice. Serve hot with raita or curd. This is a simple version of kothu chapathi. 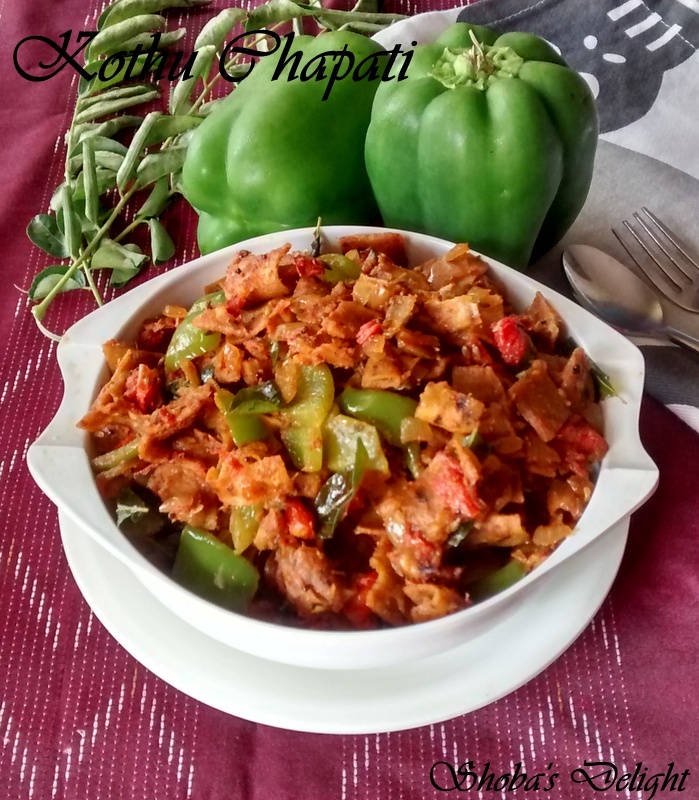 You can add scrambled eggs finally to make Egg kothu chapathi. You can add chopped carrots and green peas. 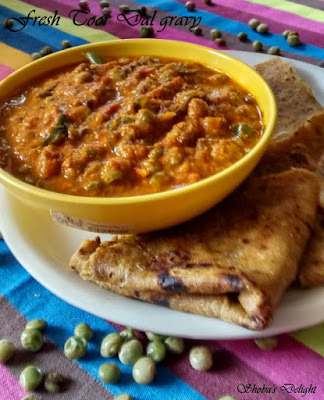 Whole toor dal is a type of lentil and is also known as pigeon peas. 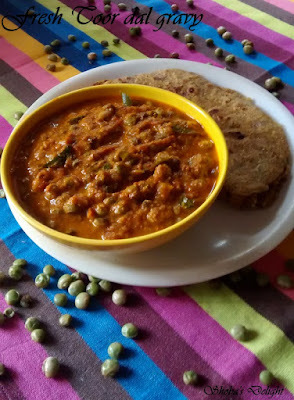 This can be served with rice or rotis for lunch or dinner. I prepared pulpy gravy that suited the beans very well. Cool sunny winter afternoons are leisurely spent sitting and shelling fresh beans. They are loved by everybody so much that they replace dried beans and lentils in almost all the staples.Bangaloreans love their fresh beans and lentils. When they are in season, families eat them at least for one meal every day! They are not only very nutritious but also totally delicious. They are creamy when cooked well and have a very mild bitter aftertaste. I use them a lot in my kitchen. This time I cooked them a little differently so I thought I should share this quick and easy recipe with you all. 1. In a pan, add the oil, mustard seeds. Allow them to splutter. Add the curry leaves and onion and fry till onion is soft. 2. Add the tomatoes and cook on low flame for 10 minutes till tomatoes turn soft and mushy.Put the dry masala powders and fry for a minute; pour two cups of water and let it come to a boil. Add the tur dal, enough salt and mix well; cook covered in simmer for 5 minutes. 3. Cover the pan with lid and cook on medium flame for 10 mins. Adjust salt. Add coriander leaves. Serve with rice or rotis. Serve garnished with coriander or fresh cream to accompany phulkas or rice. If you are adding lemon juice, add it at the end before serving. Frozen beans can work fine too,just transfer to the pan and start cooking along with the spices. Brown rice is a source of many beneficial nutrients, including fiber, magnesium, zinc and vitamin B-6. White rice, which is refined brown rice, has smaller amounts of these nutrients than whole-grain brown rice. 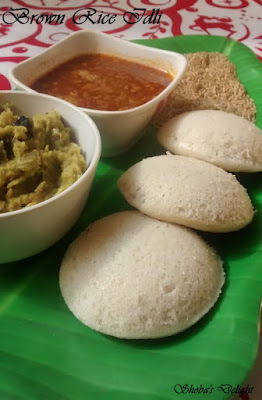 I made idli with brown rice along with idly rice and it came out well. Idlis are an indispensable part of a typical South Indian breakfast menu No pre-planning, soaking, etc. and still we get to eat idlis whenever we want.. I still love idlis made the regular way. 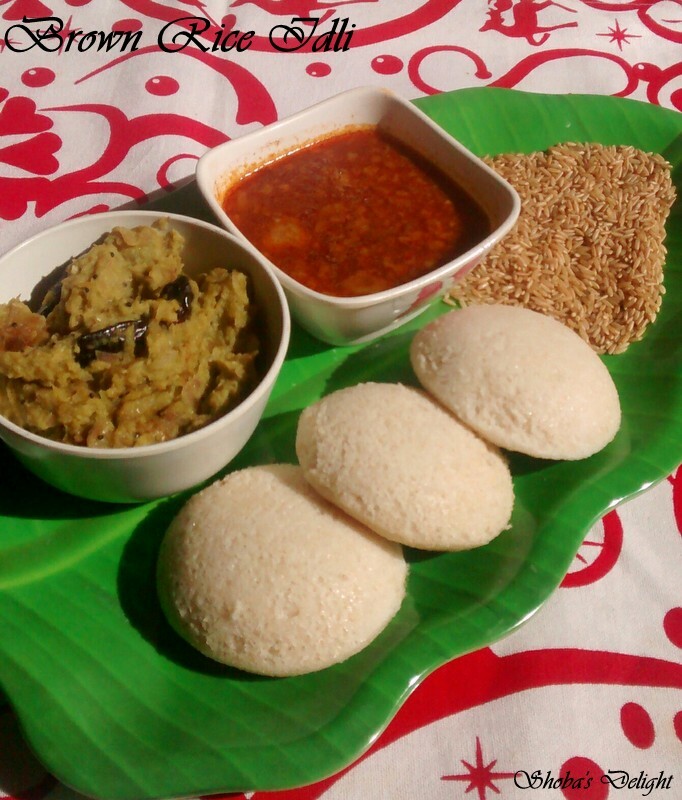 I have used the whole ingredients and brown rice to make a healthy Brown idli.... Wow! Was so happy and could not wait for the next day to gobble the idlis. And as you can see, they came out really well and we enjoyed it dipping into the chutney... Fiber rich food leading to weight loss, Rich in Selenium which reduces the risk of colon cancer, Reduces risk of metabolic syndrome. So we have to make in lesser quantities & keep it for one day. 1. Wash the brown rice 2-3 times to remove the impurities.Soak the brown rice and whole urad separately for 5 to 6 hours. Now drain the water and grind them in the grinder adding salt & water Add water in regular intervals. 2.Grind brown rice with little water coarsely first.. Add washed poha to this mixture and grind till it forms a paste of consistency just short of smooth. Mix both the batters well adding salt with hands to kick start fermentation..
3. Keep in a warm place for 8 hours or overnight. While making idlis, grease the idli molds with little oil and fill it with the batter..
4. Steam for 15 to 20 mins or till the surface of the idlis look cooked. Allow it to cool.. Remove the idlis using a knife or spoon.. Serve hot with chutney or sambar. Do not make the batter too thick or too thin. The consistency should be like our usual idli batter. Copyrights: Shobana Vijay. Picture Window theme. Powered by Blogger.